The Jaxson takes a look into the past of downtown's surface parking lots: The Cunningham Furniture Company. Established as a small bicycle shop called Bettelini’s Cycle Agency by John Arthur Cunningham in 1889, the Cunningham Furniture Company eventually grew to become Florida’s oldest furniture company and one of the Southeast’s largest home furnishing businesses. Born in Philadelphia, Pennsylvania in 1874, John Arthur Cunningham moved to Jacksonville, founding Bettelini’s Cycle Agency bicycle shop in 1889. Following the Great Fire of 1901, the business expanded to become one of the Southeast’s largest home furnishing businesses. Using the slogan “a name that means more in furniture”, Cunningham’s business specialized in wholesale and retail furniture, carpet, rugs, house furnishings, and music instruments and was located in the Masonic Temple building at the intersection of Bridge (Broad) and West Forsyth Streets in LaVilla. On August 3, 1928, John Cunningham passed at the age of 54 in Atlantic Beach and was buried a few days later in St. Mary’s Cemetery. His widow, Cornelia became the store’s president. When she remarried a few years later, her new husband Colonel William Eric Fowler took over the business. 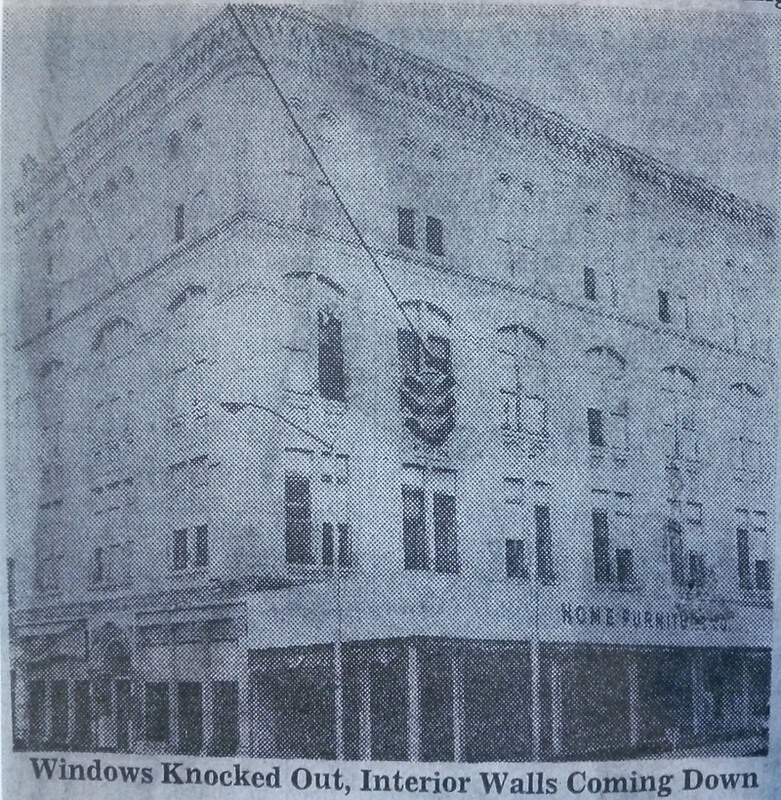 What became Cunningham Furniture’s first large location was originally a 19th century masonic lodge. Courtesy of the Jacksonville Public Library Special Collections Department. Cunningham Furniture building being demolished. Courtesy of the Jacksonville Public Library Special Collections Department. 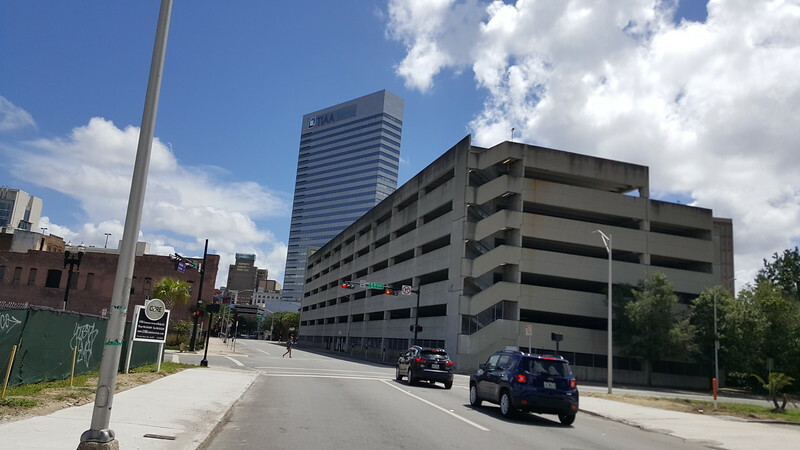 For $2.00 per day, downtown visitors have the privilege of parking their cars on the same foundation that held up the original Cunningham Furniture Building (shown above) at the northeast corner of Forsyth and Broad Streets. In 1956, the Sears, Roebuck & Company announced plans to build downtown’s largest department store on Bay Street, between Pearl and Hogan Streets (current site of the Omni Hotel). This announcement opened up the opportunity for Cunningham Furniture to purchase the old block-long Sears store that sat across the street from the furniture company, on the southside of Forsyth Street between Broad and Clay Streets. Completed in 1957, this move made the Cunningham Furniture Company one of the largest furniture stores in the South. By this time, the area around the store had transitioned from a red light district into cluster of furniture operators. Nearby competitors included the Davis, DeLoach, Ford, Jacksonville, Liberty, Mather, E.C. Newsome, Pierce-Wall, and Progress furniture companies. The old Sears store was located on the southeast corner of Broad & Forsyth, stretching an entire block to the intersection of Forsyth and Clay. The demolition of the former Sears Roebuck and Company Department Store (later Cunningham Furniture) at Broad and Forsyth Streets in 1987. Courtesy of the City of Jacksonville. 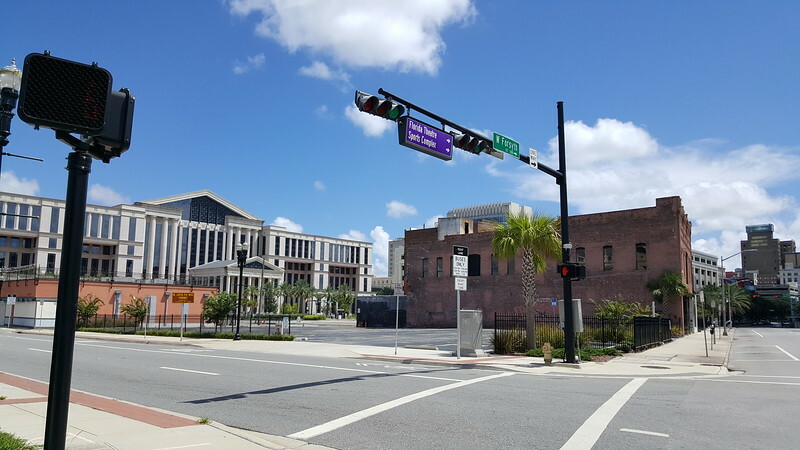 The Cunningham Furniture Company would prosper in downtown and anchor this gateway block to LaVilla for nearly three decades. 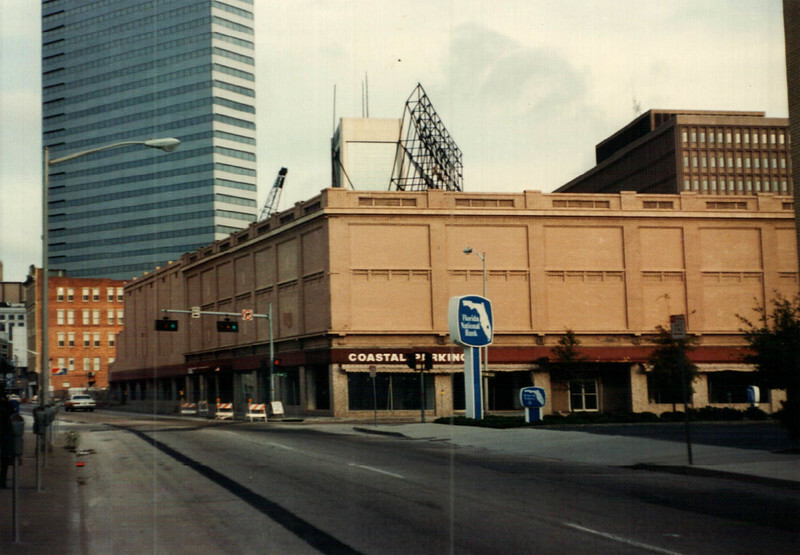 However, the 1980s would bring an end to Cunningham’s era as Jacksonville’s oldest furniture company. Like Sears (closed 1981), Rosenblums (closed 1981), Furchgotts (closed 1984), Levy-Wolf (closed 1984), Ivey’s (closed 1985), JCPenney (closed 1985) and May-Cohens (closed 1987), Jacksonville’s largest furniture store would also cease operations during this dark period of downtown retail. After 95 years of operation, the Cunningham Furniture Company closed for good in 1984. 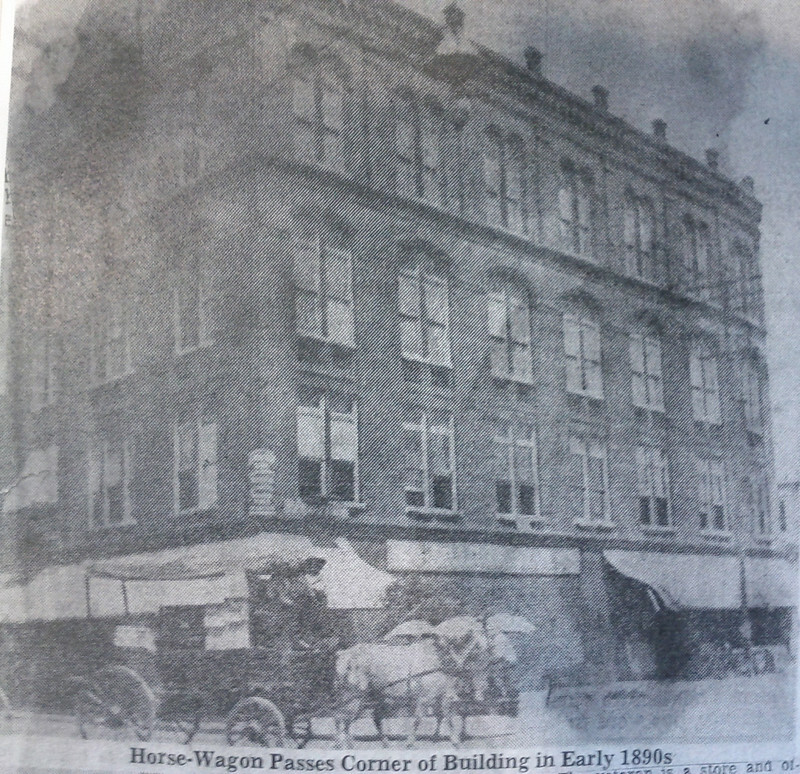 However, the vacant historic building that housed this company would not remain vacant for long. This entire block would soon be leveled to make way for the multistory parking garage, completed in 1988, which stands there today. Cunningham Furniture Company (old Sears location) site today.